A question: Does it makes sense for a housewife to drive an expensive roadster, when the vehicle is mainly used for shopping and transporting the children? Of course not! It would often be wiser to think about necessity and functionality and to set them on top of the list. Something that is true not only for the fields of cars. 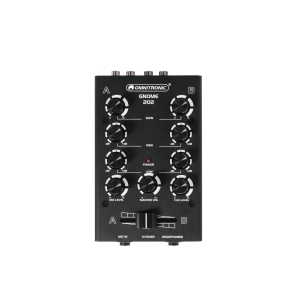 Our OMNITRONIC PM-408 DJ-Mixer therefor sets a perfect example. So you only need a reliable, solid standard mixer with current standard features and an appealing design? For you three input channels with gain control and a 3-way equalizer, one microphone channel with a 2-way equalizer and talkover function, a replacable crossfader, super-smooth channel faders, a 10-digit stereo LED level meter and master level control, two switchable line/phono inputs and a headphone input of course are enough? Then the PM-404 is your choice. Because this mixer is an uncomplicated and unexpensive alternative for the home mixing area as well as for a bar with DJ. The own demand surely is he decisive factor. But sometimes it doesn’t need to be more!